Click Here. Double your traffic. Get Vendio Gallery - Now FREE! Payment Shipping Additional Information Apache Bead Loom Book Beading Patterns Victorian 1903 Click to View Image Album Apache Beadwork Instructions and Designs! Spiral Bound Book RepublicationÂ Originally Published in 1903! If you are the first to bid on thissale, using the buy-it-now option, YOU WIN! There's no chance of being outbid! DON'T WAIT! 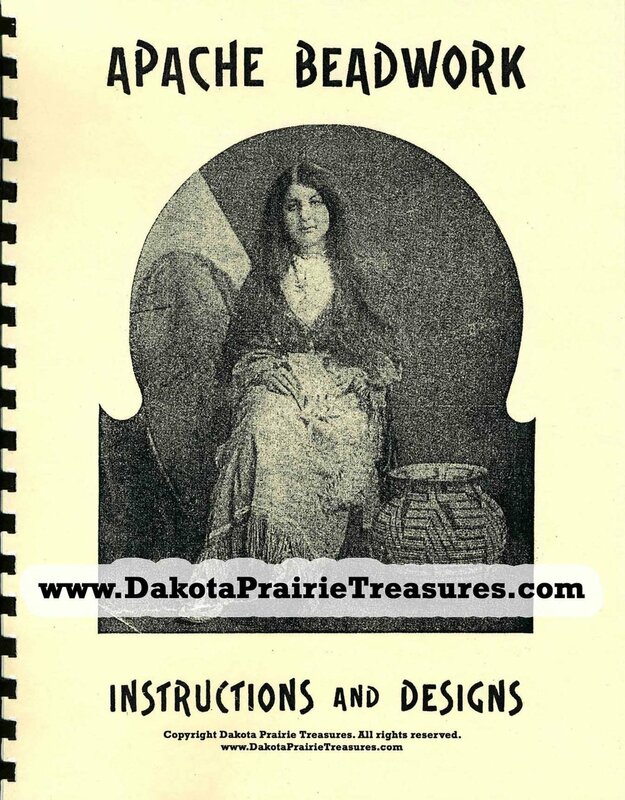 Up for bid is another Dakota Prairie Treasures(TM) Spiral Bound Book RepublicationÂ of the original Edwardian Era "Apache Beadwork Instructions and Designs" produced by Austin-Walker Sales Co., published in 1903! These folks provided some of the best instructions books in their day for the bead arts! The experienced needlecraft and fancywork artesians of the early 1900's (Victorian and Edwardian) clamored for this type of item and with good reason! This HISTORIC item contains instructions, graphed designs and fundamentals for creating the extremely handsome loomed beadwork items of the early Edwardian era! (Original is not for sale) Our new line of Spiral Bound Book RepublicationsÂ oh-so-conveniently lie flat while in use! This is a unbelievably nice touch if you have every tried to read a pattern's instructions while your hands are full of your in progress project. As an avid needle worker myself my personal experience prompted my choice of spiral binding for it's ease-of-use alone. I bet you'll love it too! This item is a great resource for those who love beading the great old styles, those involved in historical reenactment, bead enthusiasts and students of historical clothing, fiber and textile arts, etc! Includes loom bead work, illustrated projects with written instructions plus color and shading guides! There are 56 patterns in workable, large sized patterns for your beading pleasure! These patterns could also be used for the sister crafts of embroidery, petit point, cross stitch, beaded crochet, beaded knitting for clothing embellishments, doilies, table runners, household decorations, kitchen towels, bed and bathroom decorations and much much more... You will also find historical facts on this ancient craft as well as various RARE and UNIQUE guidelines to assist you along the way to recreating the needleworked bead items of a classy and gentile society! One pattern included is described as having been old in George Washington's time! These instructions are characteristic of the fancy work done by our oh-so-feminine lady ancestors during the Victorian and Edwardian eras! This is the perfect opportunity to purchase your own version of another wonderful craft book revealing our heritage from early America and Europe! An excerpt: "Rare indeed is the woman whose fingers do not linger lovingly on the beautiful beads which are so temptingly displayed on the counters of all the large stores. Rarer still is the one who does not secretly, if not openly, break that commandment which admonishes us not to covet, as her eyes wander from one basket to another filled with their treasures which vie with the colors of the rainbow...(at) This time it is the Indian work which is done on a hand loom that is attracting lovers of fancy work: and the handsome indeed in design and workmanship are the belts, sashes, fan, lorgnette, and watch-chains, purses, bracelets and fobs, which are woven on these looms." CONTENTS First Requisite The Apache Beadwork Loom Directions for Using the Apache Beadwork Loom Materials Fancy Alphabet Patterns Graph Sautoir or French Beaded Chains Directions for Making Sautoir Chains Watch Fobs Fleur-de-lis Bow Knot Chalk White and Black Geometric Design Knights of Pythias Ancient Order of Hibernians Shamrocks Odd Fellows Knights Templars Masonic Epworth League Order of Elks Christian Endeavor Knights of Columbus Knights of Honor Royal Archanum Beaded Chains for Watch Fobs Round Grecian Design Geometric #1 Violet Design Diamonds Stylized Mountains Stylized Rope Twist Stylized Clover Leaf Narrow Blank Band Graph to Create Your Own Beaded Chain Design Stylized Geometric Flower and Leaf Design Turquoise Flower Wide Blank Band Graph to Create Your Own Beaded Chain Design General References and Instructions to Make Bead Strips for Collars, Cuffs, and Waist Trimmings Bow Knot Design Fleur-de-Lis Geometric #1 Grecian Design Geometric #2 Eight-pointed Star Sampler Chains (Necklaces or bracelets) Hearts and Flowers Paisley and Diamonds Geometric #3 Geometric 4 Floral Geometric Leaves #1 Geometric Leaves #2 Split Geometric Chain ("odd and beautiful" with focal bead and beaded tassels) Directions for Fancy Woven and Strung Chain (with fringe) Violet Card Case or Pocketbook Card Cases, Purses, Chatelaines, and Wrist Bags Bead Card, Cigarette, or Cigar Case What is a Better Present to Your Friends? Forget-me-not Design Wrist Bag Bead Bag Top Violet Wrist Bag Wrist Bag Old-Fashoned Design for Chatelaine or Wrist Bag "This very old-fashioned design for a wrist bag with the church, trees and flowers...is copied from a bag work by a maiden in the days of George Washington and gives an idea of the coloring and design in beadwork of that period." Chatelaine, or Wrist Bag "This dark red poppy, with its green leaves standing out upon a jet black background, makes a rich and handsome bag, and is one of the most beautiful pieces of beadwork given in this book." New Shaped Beaded Wrist Bag Chatelaine Bag Wild Roses "Apache" Tam O'Shanter Purse Top Improved Tam O'Shanter Change Purses The Bead Purse to Suspend on the Woven Chains Plus Various Wonderful Advertisements from the Edwardian Eras The ladies of earlier times put their hands to such marvelous work and now you can too! These are beautiful items and sure to delight you and yours! These instructions are very clear and easy to follow and yet the experience needle worker will be capable of altering as per individual needs and artistic whim. Pretty much everything you need to make the exquisitely delicate and useful needlework items presented but the fabric, silk or cotton just have to hunt a little bit! :) Or, you can obtain the contemporary materials at your nearest fabric, craft or hobby store... What a historically educational and delightful bead art instructional piece this is! The Spiral Bound Book RepublicationÂ you will receive is representative of the types of needlework expertise of earlier genteel and feminine American and European culture! If you're into nostalgia like I am you will have many hours of enjoyment recreating antique needlework items for yourself or others dear to your heart just the way your great-grandmothers did! You will appreciate the attention taken in providing a TOP QUALITY PRODUCT that you will use for many years to come. This information has been scanned at a high resolution and electronically revamped to provide you with the very best hardcopy reproduction. Unlike other reproduction sellers this is NOT a cheap, grainy photocopy! Our Spiral Bound RepublicationÂ has so many more advantages over the original book. What are the benefits of our antique book Spiral Bound Book RepublicationsÂ? * Our products are produced with front and back covers of heavy stock paper. * Our spiral binding allows your book to lie flat during use for ease of viewing while working on your needlework projects. * Our products do not cost a small fortune for you to obtain and enjoy. * Every image and every page has been scanned to produce crystal clear images and you never have to deal with any crumbling old paper! * These scans are enlarged to full-page dimensions for ease of viewing! * You can gift these wonderful Victorian, Edwardian, Flapper and Depression Era pattern finds with family and friends! *Each item is shipped with extra packing materials to prevent it being folded or bent while traveling through the postal system! Curious about the quality of these scans? Please contact me and I will forward an image for your own personal inspection! You will appreciate the attention we have taken in providing you with a TOP QUALITY PRODUCT that will be use for many years to come... Check out Dakota Prairie Treasures' current sales for many other unique needlework CD Spiral Bound Book RepublicationsÂ for your creative needle working pleasure! Payment: Payment: PayPal only as per new (10-2008) seller regulations. Shipping: Within the USA: 4.59 via USPS. Out-of-country destinations (Canada included): 8.95. Combined shipping is available for all Dakota Prairiesales ending within 48 hours. A 50% s/h discount will be automatically applied to each item after the first purchase in all combined orders. Copyright Restrictions: All Dakota Prairie Treasures needlework, design and/or other CD or hardcopy products produced by said seller are copyrighted and owned by us (as is all listing text and photos). Any descriptive text and trademarks provided by the seller in this listing's title, subtitle and description are the sole property of Dakota Prairie Treasures. All rights reserved. You are permitted to use our product's information for items you make for yourself, as gifts or for items you may produce to sell. However, the original designs and images remain the exclusive legal property of Dakota Prairie Treasures. Neither the CD Product content or hardcopy designs or images, or any part thereof, may be reproduced, used in class lessons or duplicated in any media format to be resold or "shared" (either individually or as a package) without Dakota Prairie Treasures' prior written consent. Any and all violations will be prosecuted to the full extent of the law. Returns allowed due to manufacturing defects only. Payment Back to Top I accept the following forms of payment: PayPal Shipping Handling Back to Top Why Buy Just One? Receive a 50% shipping/handling discount on all items in your order after the 1st purchase, providing all are paid for in a single payment as invoiced! Payment: Paypal only as per new (10-2008) seller regulations. Please visit our othersales store listings for more items of similar interest! US Shipping 4.00 USPS Media MailÂ 4.95 USPS First-Class MailÂ International Shipping 9.95 USPS First-Class Mail International Additional Information Back to Top FREE scheduling, supersized images and templates. Get Vendio Sales Manager. Make your listings stand out with FREE Vendio custom templates! FREE scheduling, supersized images and templates. Get Vendio Sales Manager.